In your day-to-day activities, you may need to retrieve a lot of data. Sometimes, you need very specific information. How can you retrieve the exact information you want and when you need it? That’s where Flexie’s SQL access comes into play. Flexie offers you SQL access, thus allowing you to query your data for just about everything. Our intuitive User Interface lets you get hints about tables and field names. Get the information you want, whenever you need it. From time to time, you may want to access your data from the database. Writing SQL queries is one of the best ways of accessing data you need, when you need it. In Flexie CRM, you can write your own queries and access the information you need. 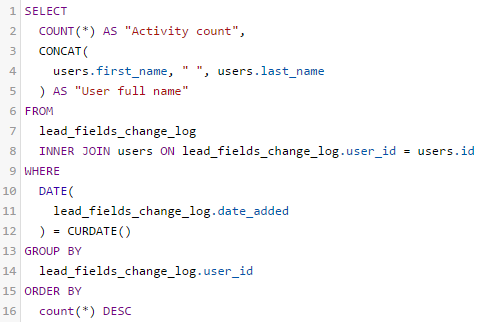 By writing your own SQL queries, you will have all your business data close at hand. The flexibility you gain by writing SQL queries is huge, because you don’t have to lose time searching through vast amount of data to find exactly what you need. You can always check if the queries you have written are correct. Furthermore, you can easily format them.